Get out from the ticket gate of North/South exit, turn left (to North Exit). Immediately turn right and go straight about 100 meter till the end of narrow street. Go across the road and turn right, seeing bicycle parking on your left. And turn left on the first corner, go between two bicycle parkings. Soon you can see line of train appear on the ground, and entrance of Atrier Q is on your right. 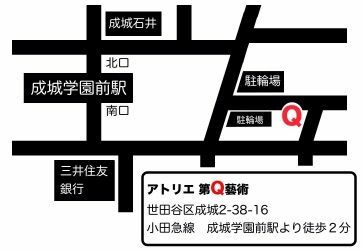 You can also go from South Exit of Seijo Gakuen Mae St.